Comparing two dividend giants to find the stronger investment. If you're looking for a blue chip stock with a stellar track record of dividend hikes, you're bound to keep bumping into Procter & Gamble (NYSE:PG) and Johnson & Johnson (NYSE:JNJ) as investment candidates. After all, between them they boast dominant market positions that have helped deliver 114 years of consecutive dividend raises (54 straight for J&J and 60 straight for P&G). Yet the two companies are on different operating trajectories right now, which could make one a better investment over the other. Sales growth is for the past complete fiscal year and excludes currency impacts. Data sources: Company financial filings and S&P Global Market Intelligence. Johnson & Johnson is getting back to its market-beating ways. The healthcare titan endured a slight sales decline and a 3% drop in net income last year thanks in part to generic competition around its hepatitis C treatments. But 2016 is a different story. Organic revenue is up by about 1% through the first half of the year, and net earnings are up 5% over that time. "We continue to see good momentum," CEO Alex Gorsky told investors in July, "supported by strong underlying growth across our enterprise." The pharmaceutical division had a particularly strong second quarter by logging a 10% boost in organic sales. Yet its consumer and medical device businesses also chipped in solid improvements. For P&G, it's too early to claim that a rebound has taken hold. Yes, organic volume finally turned higher last quarter. But the consumer products giant is still struggling to defend its market share against threats like value-based competition. And that weakness has made it impossible to deliver the level of profit gains that shareholders expect. Rather than the high-single-digit earnings growth that P&G targets, core EPS fell slightly in each of the last two fiscal years. CEO David Taylor and his team are forecasting a rebound to roughly 6% growth this year even as organic growth slinks along at just 2%. On cash returns, P&G gets the nod. It isn't exactly a fair fight here, though, given that the company is selling off portions of its business and directing a big chunk of the proceeds right back to shareholders. After divesting 100 brands from its 163 brand portfolio, including Duracell batteries and Coty beauty products, P&G is confident that it can deliver roughly $18 billion per year to investors through stock buybacks and dividends through fiscal 2019. Johnson & Johnson's cash returns are smaller, at $13.5 billion last year. However, the healthcare giant does have P&G beat in the area of dividend growth. Its payout has grown at a steady 7% annual pace over the last five years while P&G's growth rate has fallen from 7% in 2014 to barely 1% this year. On a price-to-earnings basis, there isn't much space between the two stocks' valuations. 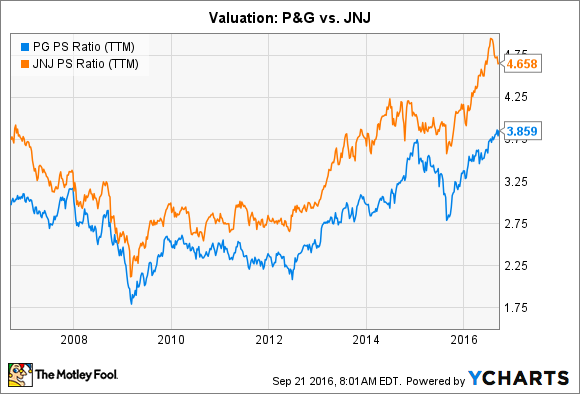 P&G seems slightly more expensive at 24 times earnings compared to J&J's 22. Looking at sales, it's clear that the market is assigning a large premium to Johnson & Johnson. In fact, the valuation gap has rarely been this big between the two companies. PG Price-to-Sales Ratio (TTM) data by YCharts. Considering its higher profitability, stronger sales growth, and better recent dividend history, Johnson & Johnson's premium is well deserved, in my view. So at these prices, I'd make a long-term bet on the healthcare giant over Procter & Gamble today.